Airport and Airfield operators can now access an administration portal to see all flights inbound & outbound, at no cost. It gives you access to view all GAR forms that have been filed online for your location, whether filed by yourself, operators, or pilots. It allows you to quickly and easily satisfy Border Force audit requirements and check whether pilots have completed a GAR form. 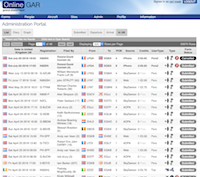 You can see the majority of information submitted on the GAR forms with the exception of any personal data such as Passport Number and Date Of Birth. You must be an airfield administrator with an official airfield address to continue. DO NOT CONTINUE IF YOU ARE NOT AN AIRFIELD OWNER OR ADMINISTRATOR! For a normal user account you need to click the 'Register' link above instead. To start, Click I AM AN AIRFIELD ADMINISTRATOR and complete the registration. We will need to verify that you are allowed to see this information - the easiest way to do that is for the email address to be like the airfield (i.e. you@yourairfield.co.uk). If you can’t do that, we’ll need to manually verify you before you can see any information. If you wish to discuss this first, please email carl@onlinegar.com.